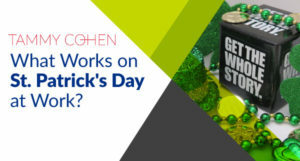 By Tammy Cohen, PHR, SHRM-CP Having the maiden name of McClain, St. Patrick’s Day is a major holiday for me. So, at InfoMart, we begin our festivities in the morning and the fun never ends. Irish and non-Irish alike participate in St. Patrick’s Day, and when it falls on a workday, it is a pot of gold of employee engagement and a social media opportunity. On March 17th, we’re all Irish! “A great employee is like a four-leaf clover: hard to … Continue reading What Works on St. Patrick’s Day at Work?